Poster printing provide a logical and cost effective way of marketing your business. If strategically placed they can be a great way to communicate with specific target markets, for example a takeaway might place their posters at bus stops or a train station to target hungry commuters. A well-designed poster will stick in a viewers mind and can be a great tool for small businesses to create brand awareness. Leeds poster printing is cheaper than many other methods of print marketing available. A3 posters are the perfect size for small indoor areas with limited space, our A2 Posters are perfect for medium sized information and graphics, while our A0 Posters are great for being viewed from a distance while still able to read the information clearly. We want to make sure your posters are perfect for you, for this reason, we offer a poster printing design service which enables you to work closely with a designer to create a design that best suits. At Leeds Printing Company we offer full colour poster printing in Leeds, from A4 to 6 Sheet on highly durable 150GSM gloss or matt paper, ensuring that the finished product creates the best possible impression. Prices below for single sided poster printing, 150gsm Posters. Price includes VAT. Prices above are for single sided / full colour Posters on 150gsm paper. Standard delivery time for poster printing is 3-4 working days for orders placed by 16.30 complete with print-ready artwork. Price includes VAT. What Stocks do you print Posters on? 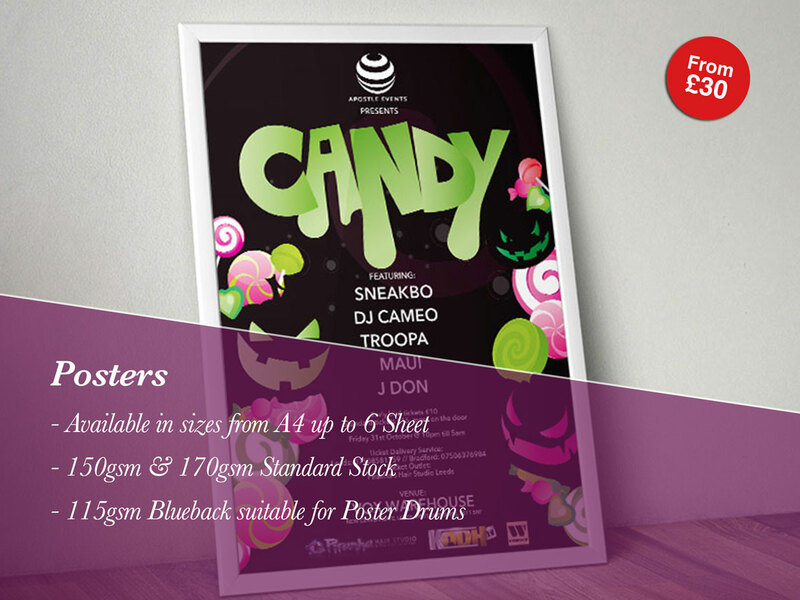 Our standard posters are printed on 150gsm Matt or Gloss.